Welcome to another new year! It’s time for a restart, fresh start, clean slate…however you refer to it, the whole world keeps turning, but with a turn of a calendar page, the ritual of starting over is a mental state of mind. All those things on your to-do list have suddenly risen to the top of your awareness and the rush to do it all comes back into focus – the workouts, the weekly meal planning (do you really do this? wouldn’t this be great to do? does it last for a few weeks then you loose steam and then weeks go by…), the list of house reno’s and upgrades, new furniture, old furniture and clothing to go through (do those jeans still fit? or are you waiting to loose weight to wear them again?)….etc! It’s so overwhelming! And you thought December was busy!?? ELDOA – http://eldoavictoria.com/ – a mat class for spinal alignment and a stretch of the fascia/connective tissues from fingers to toes. Bungee fitness – https://studiofitnessvictoria.com/classes/bungee-fitness-am/ – a little support while you jump, and stretch? Bellyfit https://www.bellyfit.com/ – yoga and aerobics and movement with a DJ! Created in Victoria, BC, and it’s gone International! Rebounder – http://www.jumpingfitnessvictoria.com/ Fitness class on a mini trampoline…get bouncing! I could go on, but you get the idea. Mix it up during the week, try out a new workout once a month, you might find something new to play with. You will do exercise if its fun, it makes you feel good, and makes you smile all the way back home. As for my work schedule, its getting pretty full, thanks to all your referrals. I truly am grateful for this! I call it “job security”. I am currently booking new patients at the end of February through March. Current patients, book in early, get on the cancellation list, or contact me directly if there are certain days and times that you need but don’t see on my schedule. I’m also working on my schedule to take new courses for my continuing education, as I am never bored with learning something new or refreshing some of the old! All Hallows Eve – another fun holiday that is prominent here in North America. But I’ve heard that its gaining popularity in the UK and Asia. The funniest trend to me is the costumes for dogs and other pets. I’ve gotten lost in the internet checking out the hilarious costumes created for our furry friends. My favorite is the taco! 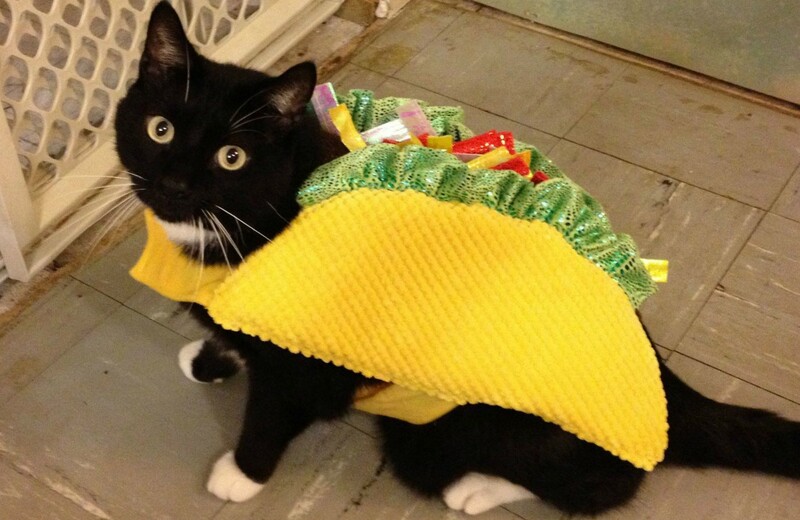 Did you know that Taco Cat is Taco Cat backwards?! But seriously here. This 4 video playlist from Buteyko Clinic International with a presentation about the importance of nasal breathing, why nitric oxide is important to the lungs, what happens with obstructive sleep apnea, why we need breathing retraining, and lots of research to support his nasal exercises and why we need to learn to breath through our nose during the day and, very importantly, at night as well. There is an associated reduction with rhinitis, asthma, OSA, apneas, anxiety, and other breathing disorders. Please check them out. August ended with a lot of haze from the fires in BC. I hope your lungs did well despite the air quality! Did you know that air filters sold out in many places on the island? It’s kind of a bummer that some needed to resort to that, but the breath is so important to us all. We still live in a very lovely part of the world and sometimes we just need a little help with our health. There are many reasonably prices home air filtration systems for under $200 that help keep the air inside the home free of dust, mold, and other particulates. You might want to consider a HEPA (High efficiency particulate air) system as well, as its the level of filtration that hospitals use. Some people report sleeping better and breathing better while sleeping with it in their bedroom. And now comes the “F word”….yep, I’m going to type it: FALL. It used to be my favorite time of year, especially Halloween! But I feel that we were denied a bit more warmth in August because of the smoke in the air. The start of school also signals the beginning of this season, so remember the 30kph is in full effect around schools, but we should be aware of all reduced speed zones in our neighborhood and especially as we commute. There are lots of cyclists around and keep an eye out for the random pedestrian! They come out of nowhere sometimes. Next will be the leaves falling and raking the yard. Gardening is never boring. I’ve found a few random bulbs thoughtfully replanted by our neighborhood squirrels and find a couple of nice surprises in the spring with tulips popping up in places I know we (my husband) didn’t plant. I like to say that our bodies and minds are high maintenance – there is always something to work on. I introduce to you Logosynthesis. I’ve been working with a Life Coach over the past year and she introduced me to this very simple and easy to use system for getting rid of attachments, that is the simple explanation. Here is more: “Imagine saying a simple sentence and feeling how fear, anger or shame are being pulled out of your system. Imagine how the causes of pain and sorrow stop hurting you. Dutch/Swiss psychologist Dr. Willem Lammers has transformed ancient knowledge and modern theory into an elegant model for guided change, for personal and spiritual development: Logosynthesis. figure8therapeutics is in Victoria, BC.